This is a fairly no frills 21.5″ monitor from BenQ. You’ll be looking at this if you want something on the cheaper end but still has good response times for a better gaming experience. It is a TN based monitor which means it comes with decent response times, quoted as 2ms in their specification so you should get a good ghost free image out of the GL2250HM. TN screens tend to suffer when viewed from the side or above, but if this is going to be a desktop screen you shouldn’t let this put you off. You might want to think about the slightly bigger model, personally I would go for a 24″ screen of course you will have your own deciding factors. It’s worth a quick look though. For a screen on the cheaper end of the scale it is good looking enough. The bezel is quite noticeable compared to more modern, and more expensive, offerings but if you are looking in this price bracket you probably aren’t too concerned about that. Personally I would consider stepping up slightly to a 24″ screen, but if space is at a premium and you have to keep costs down then I can see why the smaller model might appeal. The monitor comes with HDMI which means hooking this up to a PC or console such as the PS4 is no problem. Speakers are included but not recommended, if you want high fidelity you’ll want to make use of the audio out socket to hook up some real speakers! That said, they are just fine for when you need to bring some sound into the room. At this end of the range you aren’t getting the premium gaming features such as adaptive synchronisation technology, and it is limited to 60 frames per second. But if you are a casual gamer and don’t have an expensive enthusiast PC rig to match you’ll probably not notice. The 2ms response time is welcome. A review of feedback from users gives the impression that this monitor meets their expectations when it comes to running games on it. You’ll find even the latest shooters are perfectly playable although if you’re used to a high end monitor you will notice the difference. We give the BenQ GL2250HM a 4.5 out of 5 rating. Want to know what existing owners of the monitor think? You can read real user reviews here. Should I buy the BenQ GL2250HM? 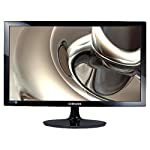 Small and inexpensive monitor for those looking for a 1080p screen that will fit comfortably when space is tight. If you are having some doubts about this purchase then why not read some real owner reviews and see what other buyers think.